For many families this once somber event has instead become a celebration of life. Videos and photos celebrating the family member’s life are common and in most cases their favorite songs are part of the service. In an effort to embrace family wishes, Service Corporation International (SCI) North Americas largest funeral provider asked Arizona Audio Visual to improve it’s A/V capabilities in the Phoenix Market. SCI owns over 20 funeral homes in the Phoenix area under its Dignity Memorial, Advantage Funeral & Cremation Services and Fueraria Del Angel brands. The first phase of the project was to improve the company’s capability to accommodate various client media storage devices during services. This involved refitting many locations with new commercial equipment that could accommodate client still images, video, and audio stored on CD’s, DVD’s, Flash Drives, MP3 players, iPads, iPhones, smart phones and computers. The goal was to accommodate any form of media stored on any device. Green Acres Scottsdale equipment is housed in Middle Atlantic rack and includes commercial equipment from JBL, Denon and Crown. 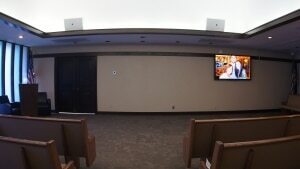 A small flat screen TV is used to monitor chapel services. 2016 marked the start of the second phase of system improvements. The goal is to elevate sound system capabilities beyond the typical modest sound system that is designed to provide sound reinforcement for microphones and background music. Three market locations were chosen and fitted with sound systems more common to houses of worship where both live and recorded music can be used as part of the service at sound levels that are well beyond typical modest sound reinforcement. Yes, these locations can now Rock the House if needed. 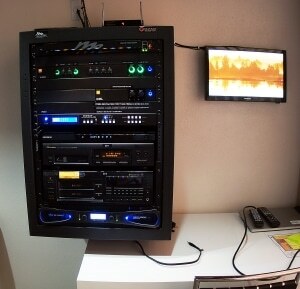 In all three locations Arizona Audio Visual added a commercial amplifier and either JBL or SLS commercial speakers. This combination allows the system to be played at modest levels for most services. However, when it’s time to take it up a notch the funeral director can accommodate the family with their loved one’s favorite musical selection at bone jarring levels (pun intended). 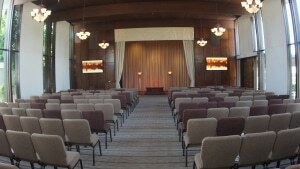 Chapel of the Chimes Mortuary Glendale main chapel view with a 65″ flat screen TV and an SLS 8290 speaker. 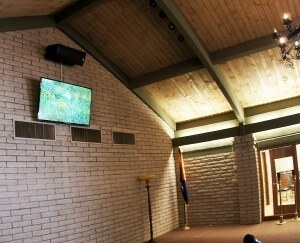 Greenwood Memory Lawn Chapel in Phoenix uses two JBL Control 30 commercial speakers and a Sharp 70″ flat screen TV.